First let us cover the forgiveness of sins. Does this concept apply to modern people of today or was it just dreamed up by controlling old men in the past to dominate an ignorant people? Let us see how the Bible actually handles this subject by examining the real meaning of the words involved. The word sin comes from the Greek word HAMARTANO which means “to miss the mark.” In other words, when the Greeks 2000 years ago, shot at a target with an arrow and missed they “sinned” (HAMARTANO) or missed the target. Is this how the word “sin” is used today? Verily no. When the religious person thinks of sin in our age he generally thinks of being unclean and ridden with guilt. Now when you shoot at a target and miss the bullseye do you feel degraded and guilty to the extent that you feel paralyzed and even feel unworthy to shoot again? No. Of course not. When you miss you may find it mildly irritating, but you generally can’t wait to have another try at it. Now guilt has been identified with sin by those who have sought to control the souls of men, but among the enlightened prophets it was not always so. To them sin was seen as a human error and salvation from sin is the path that leads to a correction of error. The prophets in times past did not seek to control through guilt, but sought to shift consciousness from error to perfection as they saw it. 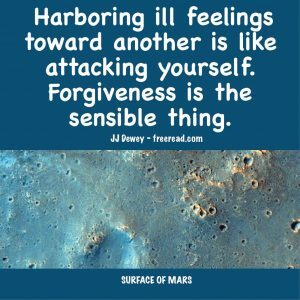 Now let us look at the second major word – “forgiveness,” for the scriptures always talk about the obtaining forgiveness of sins. Mark 7:8 For LAYING ASIDE (APHIEMI) the commandment of God, ye hold the tradition of men, as the washing of pots and cups: and many other such like things ye do. Matt 19:27 Then answered Peter and said unto him, Behold, we have FORSAKEN (APHIEMI) all, and followed thee; what shall we have therefore? Matt 19:29 And every one that hath FORSAKEN (APHIEMI) houses, or brethren, or sisters, or father, or mother, or wife, or children, or lands, for my name’s sake, shall receive an hundredfold, and shall inherit everlasting life. John 14:18 I will not LEAVE (APHIEMI) you comfortless: I will come to you. John 14:27 Peace I LEAVE (APHIEMI) with you, my peace I give unto you: not as the world giveth, give I unto you. Let not your heart be troubled, neither let it be afraid. John 16:28 I came forth from the Father, and am come into the world: again, I LEAVE (APHIEMI) the world, and go to the Father. Matt 27:50 Jesus, when he had cried again with a loud voice, YIELDED UP (APHIEMI) the ghost. Now if you substitute the modern word forgiveness in each of the above cases you will see that it just does not make consistent sense. For instance in Mark 7:8 do we forgive the commandment of God or in Matt 27:50 did Jesus forgive the ghost when he seemed to die? So how about salvation from sin? What would that mean then? Salvation comes from the Greek SOLTERIA which literally means “to rescue or deliver.” Therefore salvation from sin is really a deliverance from error. If one is taught the truth about guilt and its cause and release and the person accepts this teaching as correction then he is saved from sin or delivered from a great error in his thinking. In the old days many people believed that the world was flat. But when Columbus proved to the them that it was round it could be said that Columbus saved the world from its sin. In other words, he delivered (saved) the world from its error (sin) in thinking. When it is said that Jesus was crucified for the sins of the world the truth is that the world made a grave error in crucifying him. When it is written that Jesus saved the world from its sins the meaning is simply that he left the teachings and example necessary to correct the world from it’s error in belief and thinking. Most people did not believe a man could rise from the dead. Jesus corrected this error by demonstrating power over death, thus he saved the world from sin in this matter. Does being saved from sin or obtaining forgiveness of sin (the giving up of error) nullify the law of cause and effect or karma? In other words, if you robbed a bank in the past would the slate be wiped clean? The law of cause and effect is one of the laws of God and this will stay in place until heaven and earth pass away. Here we learn that every man will bear his own burden and reaps that which he has sowed. In other words, he will suffer an effect for every cause he initiates. Every cause will be counterbalanced by effects to the uttermost farthing. Even though these great souls were “saved from their sins,” or delivered from error in thinking, they still suffered the effects of their sins or mistakes. To forgive does not mean to neutralize the law of cause and effect, but it does mean that we let go of grievances for the holding of grievance is a great error in thought as taught in the Course in Miracles. Let us say that Jim was in a car accident that was caused by a mistake on his part and he ran into Rick, an innocent driver. Both of them were badly injured. For some time after the accident Jim was racked with tremendous guilt and cursed himself daily for making a stupid mistake. Rick also has problems for he feels a strong grievance toward Jim for the pain and suffering he has endured. Finally, Jim seeks to rectify the situation and visits Rick, explains his feelings and grief and asks for forgiveness. Rick is touched and lets the grievance pass. They hug each other and cry and both depart company feeling peace of mind again. Jim still realizes he made a dumb mistake, but decides to accept the fact that sometimes mistakes just happen. Rick realizes that Jim did not mean him harm and corrects his own thinking by letting go. Now that forgiveness has taken place and both men are filled with peace has the actual physical effects been neutralized? Are Jim and Rick’s cars suddenly restored to their new condition? Of course not. Are the scars they bare removed? Are the hospital bills miraculously paid? All the effects of every cause still remain in place. But this is a good thing because love and forgiveness are causes which produce the effects of joy and peace and thus the law of Dominating Good works through cause and effect for the long tern benefit of all.